My dieting continues and I’m still getting a kind of masochistic pleasure on 5-2 diet fast days. I’m now around 63kg. I know it’s slow, but given that I eat out in lovely places like Namaaste Kitchen, indulge in afternoon teas at One Aldwych and generally lead quite a hedonistic life style for five days a week I’m actually quite happy with the pace! Needless to say I do find myself eating a lot more fish and vegetables – it’s much easier to create a filling and satisfying meal with a base ingredient that is low in calories and gram for gram most vegetables and fish work better than bread, pastry, red meat and fats. And I’m very lucky to still have a supply of wonderful fish that Delish Fish sent me and I froze. His fish, from Scotland, is so fresh that you can easily freeze any that you can’t eat immediately. I know he’s an ardent supporter of the current ‘Real Fish Fight’ campaign to ensure that British fishermen are not restricted by EU quotas that are unnecessary or unrealistic. While sustainability is vital for everyone, fishing quotas do need to reflect genuine environmental needs rather than pander to the whims of politicians. As someone who loves Scottish and Cornish fish, I’m more than happy to hear about fish that I can use as an alternative to those breeds which are threatened, but I’d hate to find myself forced to only eat fish from outside this island because of our quotas. This weekend I pulled out a pack of lemon sole fillets from the freezer. 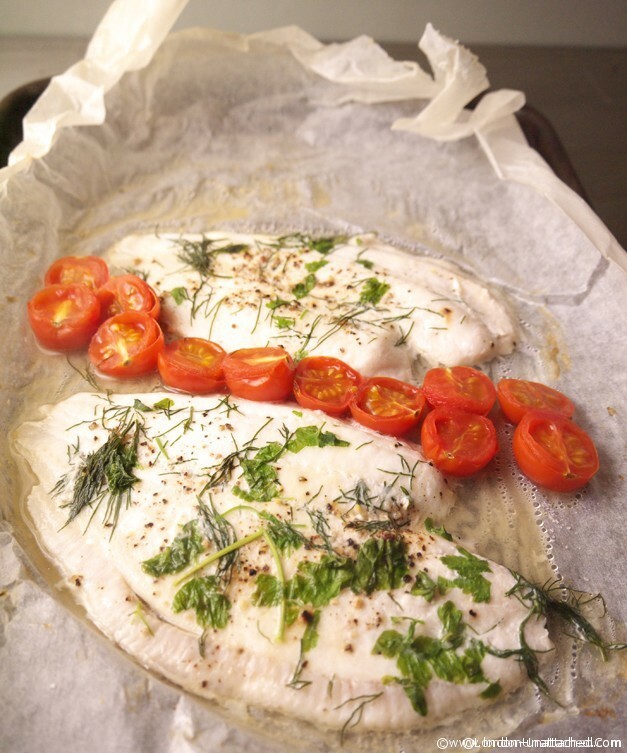 I’d been saving them, because I love lemon sole and I’ve always seen it as a treat – it’s a light, delicate, flaky fish which I love and which is very low in calories too. I got a little overexcited about how to serve it and made a less than successful puree of leek and potato. Actually it tasted good, but, it really did look like baby food. The fish itself was fabulous though, so I’m ONLY sharing the recipe for the fish which is ultra simple! Take a large flat piece of baking paper and spray with one cal. It’s a great way of cooking fish for the 5-2 diet, because you really don’t need any butter, cream or oil. 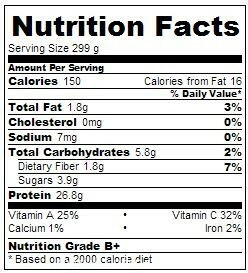 The calories come in at 150 including the tomatoes, but not including the leek and potato puree! For more about the 5-2 Diet, please check out my other posts. There are lots of 5-2 fast diet recipes here and more information and 5-2 diet tips here. If you are planning to try dieting, why not join one of the excellent 5-2 diet facebook groups where you will find (literally) thousands of other people, most of whom are finding the 5-2 diet easy to follow. I have not tried lemon sole. This looks like a real simple recipe to follow. 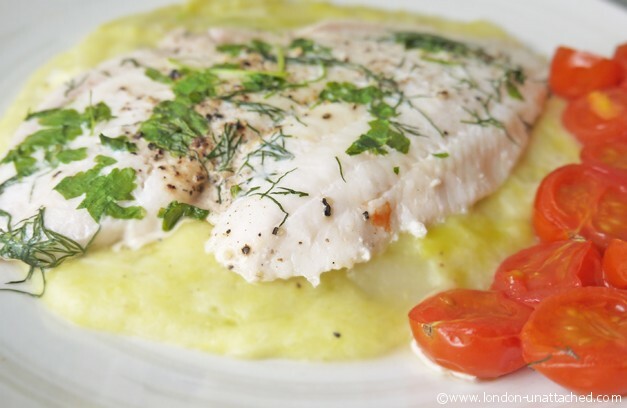 it is;) Lemon sole is quite delicate and this is a good way to cook it without losing half the fish in your pan! it’s a great recipe for anyone.. and can you subsitute any kind of fish on this Fiona? I have been on the 5:diet for nine weeks now and I’ve only lost two pounds. I keep reading about people who have been on the diet for a lot less time and have lost a stone. I’m not cheating, so what am I doing wrong? I never lost a stone in a few weeks, but you sound like you are not quite doing as well as you might want. I would check exactly the weights of what you eat and perhaps look at what you eat on the days you are not fasting. Try joining some of the facebook groups – they are very supportive and people will help you in more detail there!